An emergency radio is a critical life-saving gadget. When caught in a storm, it's best to know how far away the rescue team is. The last thing you want is feeling helpless and unaware of the situation. The weather can get too bad, the internet goes down, and there are power outages, an emergency NOAA weather radio gives the information you need to get out or stay in. 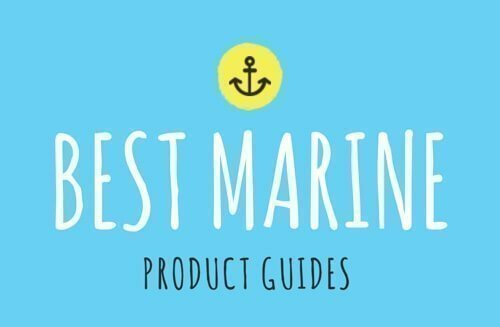 Since there are no shortages in emergency radio brands, we have put together the best weather radio reviews. These are radios that use the latest technologies including S.A.M.E technology and multiple power options. What is an NOAA (National Oceanic and Atmospheric Administration) Emergency Radio? What is a Public Alert Certified Emergency Radio with NOAA? What is a NOAA (National Oceanic and Atmospheric Administration) Emergency Radio? A NOAA radio broadcasts weather information from the nearest National Weather Service (NWS). It is also known as NOAA Weather Radio for All Hazards. The radio provides weather-related information 24 hours a day seven days a week. As an All Hazards Network, you can expect to receive information about natural events like hurricanes, tornadoes, earthquakes, avalanches, etc. It broadcasts warning and post-event information over the VHF public service band. 162.400 is considered the primary weather channel. The primary reason for having an emergency radio is to receive weather alerts. It can be a standalone receiver with the seven bands or multi-band which include AM/FM radios, VHF marine radios, shortwave receivers, etc. It is vital that you look for the Public Alert or NOAA (NWR) Weather Radio All Hazards logo on your radio. This is to say it meets the Public Alert Standard developed by the Consumer Technology Association and NWS. The radio will have must-have features like a tone alarm. It is a 1050Hz tone alarm that NWS sends before sending out a warning or weather watch. It activates the radio to start receiving even if the receiver is turned off. This technology allows you to choose and specify an area for which you want to receive the alerts. Since NWR (National Weather Radio) can transmit over many counties, S.A.M.E will help you receive only the warnings for the areas you select. You get relevant information, and alerts not relevant to your area or location are minimized in the process. There are many options in NOAA emergency radios. As we said, it depends on the information you want to receive. Standalone emergency radios have a primary purpose of issuing warnings and alerts 24/7 while multi-band radios include FM/AM and help you to tune in to the weather broadcasts when needed. A small, portable radio will come in handy during an evacuation because it can easily go in the pocket. On the other hand, it is easy to lose a small radio, and it’s also hard to locate it in the dark. 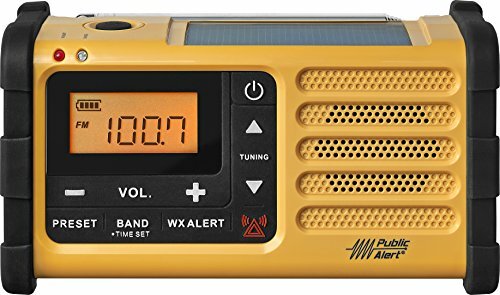 If you are in areas where the weather rarely affects your location, you might want a big radio because it has all the extra features not found on many smaller ones. Having many power options is the way to go with an emergency radio. For example, you can tune in with AC power while the batteries stay preserved for when the power goes out. The same radio could also have a solar power option so you can use it outside and still have the batteries when it becomes cloudy. 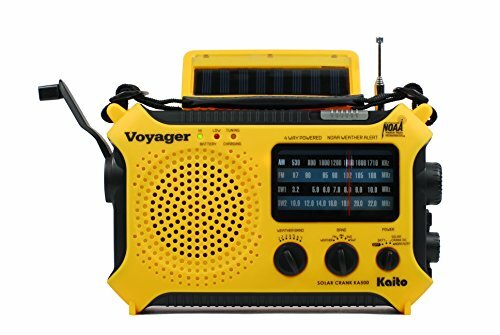 There are also radios that have a hand crank to provide power which will ensure you always receive the information you need even if you do not have electricity or batteries. You will need a decent signal to know what is actually being broadcasted. That is where the range comes in. You will also want multiple tuning options including the AM band where emergency weather is broadcast when FM fails. This feature is not a must-have, but it can prove to be so helpful when searching for extra batteries in a dark garage. Some radios also offer the option of charging your phone which is just as important to be able to communicate with loved ones. The quality of the shell and weatherproofing are some of the things that make an emergency radio durable. You will want it to have a thick plastic shell and a hand crank (if you have a self powering NOAA radio) that won’t break on the first turn. A radio that can soak up some rain, withstand impact, and protect the inner components assures you that it will last a long time and function when you need it most. 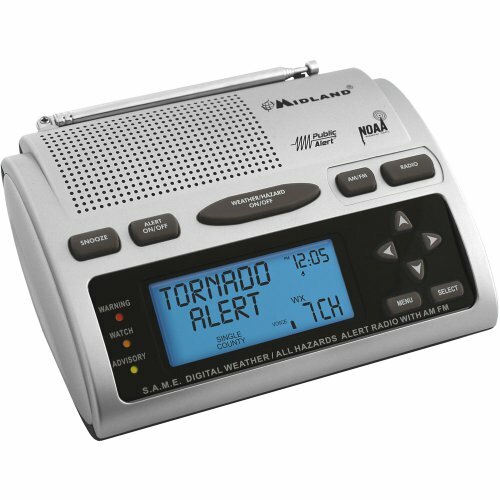 The Midland WR300 Weather Radio is a full-featured device with S.A.M.E technology. Designed to give you the alerts that you need, this radio allows you to choose from 30 programmable county codes. It has all the seven NOAA weather channels making it ideal for all states including when traveling to Canada. With S.A.M.E Digital Technology and the ability to remove alerts, this radio is your go-to for specific warnings. It offers AM/FM tuning options as well as setting off alarms, date, and time. It automatically switches from FM to AM especially in emergency situations since FM is susceptible to going out when the weather takes a turn for the worse. The Midland WR300 is Public Alert Certified. As such, it has a tone alarm and a selectable warning system. You can go for the siren that is 90bD loud, visual LED flasher, or the voice alert. All notifications are received on a blue backlit LCD that is easy to read. It has a 10-alert memory with an event expiration indicator (EXP). We like that this radio has two power options. It can draw power directly via AC or use four AA batteries. It is a well-rounded emergency radio that is a life saver for the whole family. Midland WR120B/WR120EZ is a much smaller NOAA weather radio that has all the features you need in an emergency radio. It has all the seven NOAA channels which ensure it can cover up to 93% of the USA. First, this radio is easy to carry with you. Being smaller means, you don’t need to have a location for it in the house. Second, the receiver offers S.A.M.E technology. You can program up to 25 counties which is one of the most useful features on an emergency weather radio. Unfortunately, it's not possible to remove alerts. With a 90dB siren, voice alert, and a flashing LED alert, you will not miss an emergency warning. The alarm has a snooze function so that if you miss it the first time, it will alert you several times until you are awake. There’s the option of leaving it on in a continuous mode when connected to AC power or when using three AA batteries. This radio is also Public Alert Certified. It overrides the power to turn it on when there is an emergency alert coming up from the National Weather Service. You get ten reviewable alerts and over 60 types of alerts. From tornados to hurricanes, flash floods, earthquakes, etc., nothing will hit your county without your knowledge. The outdoors are unpredictable. And when you have an NOAA weather radio that serves other purposes, you will be entertained and safe at the same time. iRonsnow IS-388 is that device to take to backpacking and hiking trips. With all NOAA channels, it’s going to give you alerts about floods, tornadoes, and other events in time. This radio has to be set in the alert mode to override the other functions to give you weather warnings. It provides multiple tuning methods including WB/NOAA, AM, FM, SW1, and SW2. This way, no matter the weather condition, there will be a frequency where alerts are broadcast. This radio provides alerts in the form of a loud siren. It has a reading lamp or flashlight option making it even more useful in the outdoors. With three power options, the iRonsnow can be solar-powered, hand cranked, or battery powered with three AA batteries. Its 2300mAh battery can recharge most iPhone models including iPhone 8, 8 Plus, X, 7, 7 Plus, 6, and 6 Plus. For entertainment, this radio has a micro SD slot. Apart from listening to regular radio channels, it can work as an MP player for listening in to your favorite tunes. The iRonsnow IS-388 is a convenient weather radio for use in the outdoors and indoors. You don’t want to miss out on the functions it brings to the table. For the price, it is incredible the functions you get from the Esky Portable Hand Crank Weather Radio. It is small, tough, and a handy device for emergencies. The Esky is a 2018 upgraded model that is sure to get you out of a storm in time. It has NOAA weather channels and can also receive broadcasts over AM and FM. 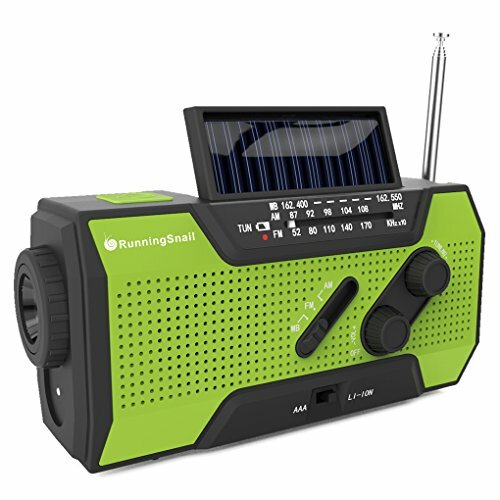 This radio uses solar power, and it can be hand cranked. Not only that, the device can be powered using a USB cable. The lithium-polymer battery provides up to seven hours of use once charged. It is a 1000mAh battery that can recharge USB-rechargeable phones which is ideal for making emergency calls. 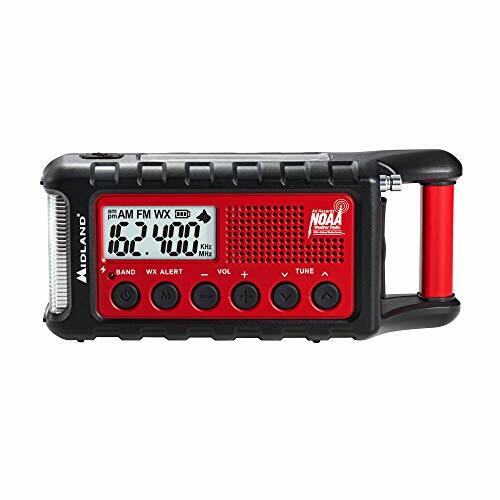 Remember that this is a weather radio so using it as a professional power bank is out of the question. But you will like the 140-lumen built-in flashlight that produces enough light to not only find your way around a winding path, but to also read and make a fire in the outdoors. The Esky is more than just a weather radio. Considering its price, it equals convenience and value. The next time you go camping, have a way to keep in touch with civilization and be found easily. The RunningSnail (no we did not make that name up) offers SOS alarm and flashing red light so that you can seek help in emergencies and even warn others. The RunningSnail allows you to be prepared when the weather hits hard. It can receive broadcasts over NOAA, AM, and FM weather channels. It comes with a 2000mAh battery that is USB rechargeable. It can offer up to 6 hours of radio time. You will also be able to power this radio by hand cranking it or continuous solar charging with a little light. And when you have exhausted power options, you can use three AAA batteries to keep it running. 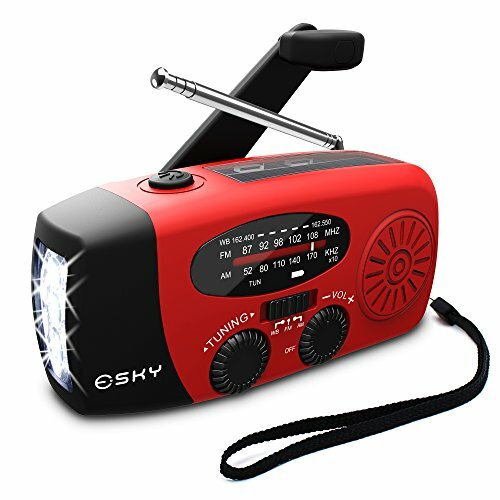 This radio has a 1W LED flashlight and table lamp modes. You can use it to find stuff in the dark or do your homework when there are power outages. It is pretty easy to use the RunningSnail since it has the band selector and volume up or down knobs. Nothing is complicated; even your kid can use it and be safe when you are not in the house. If you are not taking any chances with the power options of an emergency radio, you might have just found the best brand that has it all. The Kaito KA500 offers five power options. The Kaito might look complicated because of its analog knobs. But it’s pretty easy to select a frequency. It can receive broadcasts over all NOAA channels as well as over Am, FM, SW1, and SW2. The radio is solar powered, but it can use three AA batteries, be hand-cranked or use 5V AC or USB power. It can be an emergency charger for USB devices like a GPS tracker, phones, MP players, and other gadgets. The telescopic antenna can extend out to 14.5 inches which means you will always get better reception even in the harshest of conditions. Its durability is guaranteed thanks to its water and impact resistant ABS shell. It is the kind of radio you won’t worry about if it gets wet or if you drop it on a hard surface. What’s more, it has a 5-LED reading lamp, a flashlight function, and SOS beacon light. 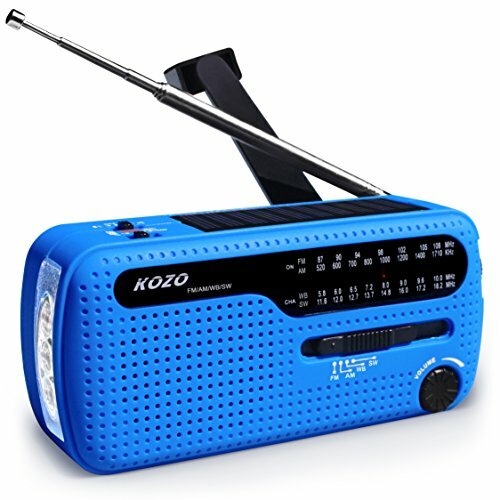 If you don’t want to spend over $100 on an emergency radio but still want impeccable functionality, the Kozo radio is a choice to consider. The Kozo is a lightweight and definitely portable emergency NOAA weather radio. It is a multi-frequency device with NOAA and also can receive broadcasts over AM and FM. The radio will alert you when NWS puts out an alert by setting off an alarm. Although it’s not the loudest, we like that it is audible over pounding rain. Its reception is enhanced further using the 15-inch telescoping antenna which improves transmission in the back country amidst snow, mountains, and other atmospheric hazards. No matter your location, no alert will pass you by. Its 500mAh battery is USB rechargeable which also means it can charge other devices like your phone. The radio also charges via solar energy or kinetic energy by hand cranking it. It can also be supplied with three AAA batteries for continuous use. We like that its cranking power is much longer since one-minute rotations can give you up to 18 minutes or running time. Midland is best known for their high-quality emergency radios. 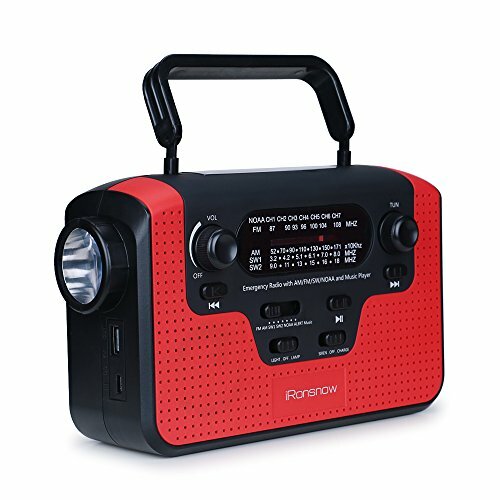 The ER310 model is the ultimate portable radio for most people. There’s so much to like about the Midland ER310. It is perfect for any emergency situation mostly because it can fit in small spaces and it is comfortable in the hands. It receives broadcasts over all the weather channels including NOAA, AM, and FM. The radio chooses the strongest signal for your area and sets off a loud alarm that alerts you of impending weather changes. It provides an LED flashlight as well as SOS and Strobe modes to use in different situations. You will be able to set the light to a low level when you want to preserve the battery power or use it in the highest setting in the darkest situations. The Midland E310 has a 2600mAh battery that is solar and hand cranking rechargeable. It can also be recharged using USB power. With the USB port, this radio will also come in handy to recharge your smartphone. It can also take six AA batteries as emergency backup power. This radio includes an ultrasonic dog whistle that is very useful in search and rescue operations to help them locate you faster. With a digital tuning system, we can see why most people love the Sangean MMR-88. This is a Public Alert Certified radio which means all its technical specs meet stringent NWS and Consumer Technology Association Standards. 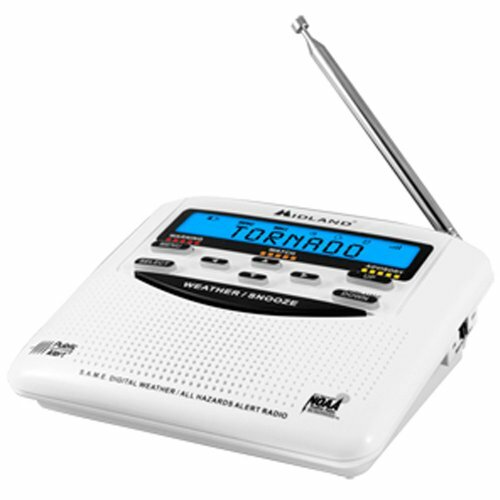 This radio lets you get your dose of entertainment while allowing you to get emergency weather alerts. It can bypass all other functions when the National Weather Service is ready to broadcast critical weather changes. It has a loud buzzer for emergency alerts coupled with an adjustable LED flashlight. You get three power sources which include hand crank, solar and USB power. The 4-level battery indicator allows you to recharge it in time so you will never be caught with a dead device. To further increase the battery life, this radio will go into an automatic shut off after 90 minutes of not being used. Remember that it can power on when an emergency alert comes up. This device can also recharge your USB-rechargeable gadgets. It is that piece of emergency tool that will offer lots of functionality and convenience. 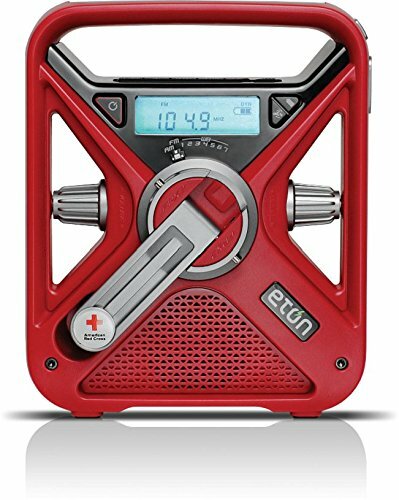 The Eton Emergency Radio is easy to recognize because of the obvious reason that the American Red Cross sells it. It is much like other emergency radios only that it uses a large USB instead of a micro USB to recharge other devices. This radio provides outstanding audio quality on all frequencies. It receives broadcasts over NOAA, AM, and FM, allowing you to be in the know and always get every word that the NWS is saying. It has to be in the alert mode to receive warnings right away instead of tuning in. The Eton uses a digital tuning system which makes it easy to get the broadcasting frequencies whether you are in the USA or Canada. We didn’t like the knobs very much because they are a bit hard to rotate. Eton could do better considering it is one of the most sought after brands. Apart from the knobs, you have a device that has an LED flashlight as well as a red flashing beacon for alerting rescuers of your location. You can protect your family and get the most out of the American Red Cross FRX3+. The Best Emergency Weather Radio is a life saving tool when the environment is changing for the worse. It is the one thing that can get you out of disaster and actually help to save lives. Our top recommended emergency radio is the Midland WR300. It has S.A.M.E technology which allows customizing of alerts of up to 23 counties. It is a bulky device so if you want a portable model, we suggest going with Midland’s ER310. It can withstand harsh weather, and it will come in in rough weather when you need to know where to go.